We’re coming to the end of our seven-day challenge to use business planning to create explosive growth in traffic, customers, and most important, income. Much of what we’ve discussed so far has been actionable steps like writing down your goals as well as mindset pieces like the one about stepping out of your comfort zone. Today is all about putting everything we’ve discussed so far, and combining it into something that can give you that explosive growth you want. You see, when you use the basic concept of exponential growth to your advantage, it doesn’t take much progress in any one area to see big results. We briefly touched on this idea back on day three when we talked about increasing traffic, subscribers, and customers to add to our bottom line. Today we expand on this whole idea in a few different ways. Then we tie it all back into setting goals and business planning in general. The idea is to make progress on your goals and stack them in a way that gives you leverage. Here’s an example. Let’s say your first goal is to grow your current part time income by $500 a month so you can quit your day job. Following the example in an earlier blog post, you come up with a way to get that done by growing your traffic, subscribers, and customers. Since you were able to eventually quit your day job, you have more time and energy to put into growing your business. You set more ambitious goals and add another $2,000 to your bottom line. Instead of taking everything out in profit, you decide to continue to work on this whole leverage idea. You set aside $100 a month to play around with Facebook ads to see if you can turn that into a profitable income stream. You take another $200 to start outsourcing some of the ongoing tasks that hold you back. You hire your first VA and now you’re really making progress. This in turn gets the attention of a fellow online entrepreneur in a related niche who wants to work on a project together. One goal builds on the next and they all work together to generate exponential growth. Of course this is just one little example. This can work in a myriad of different ways and will of course differ from one business to the next. If you start to think strategically and keep one eye on your next few moves, you can start to stack your efforts and engineer that explosive growth in a lot less time than you may think. Try it! 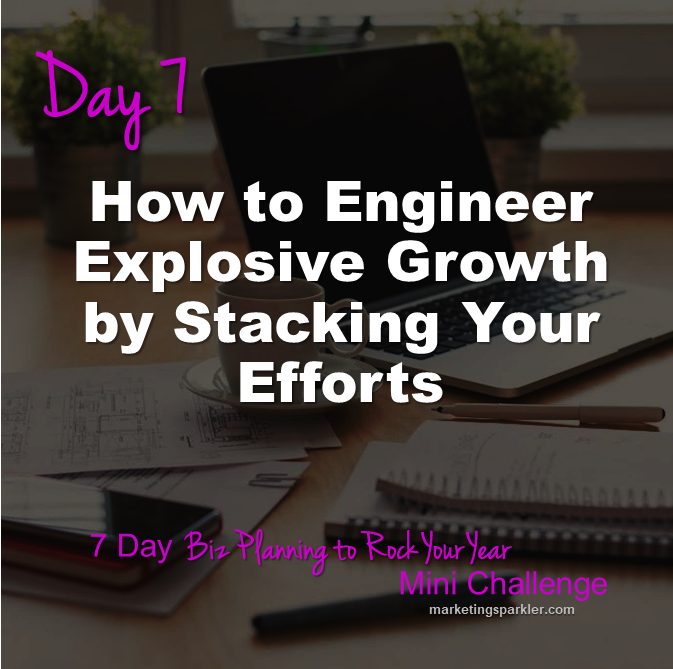 This is Day 7 of the 7 Days of Biz Planning to Rock Your Year Mini Challenge, a free, 7-day series for entrepreneurs that can be started at any time. Register and each day you’ll get an email from me with tip or a strategy designed to help you make plans for growing your business. We’re not talking fluff-n-stuff here. These are hands-on, actionable tips and strategies you can use every day to embrace planning, set ambitious goals, and then work towards reaching them. Click here to sign up for the full challenge.